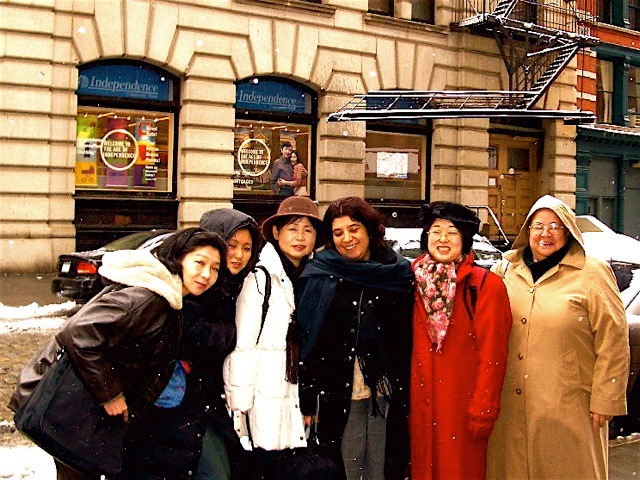 This is what a WIN UNCSW Delegation looks like – with NY snow, Emily Murase and Charilie Toledo with Japanese and Afghan Interns. A working assembly of one hundred and seventy California activists – representatives of California based grassroots organizations, commissions on women and elected women, convened at SBC Media Center, San Francisco, CA, on December 3rd and 4th, 2004. They set priority issues and recommended strategies for a California Women’s Action Agenda 2005 – 2010 and adopted a California-focused action plan to address the twelve platform issues identified at the 4th World Conference on Women, Beijing 1995. They cheered legislators who spoke passionately about their districts and neighborhoods and heard panelists who brought expertise, experience and exciting new ideas to the table. They agreed that health, education and economic equity are still priority issues for women and girls in California, that the full implementation of CEDAW in our cities and counties, the election of progressive women to local, state and federal offices and the support of progressive men can move the agenda forward. They drafted Policy Papers following panels on health, education and economic justice that are available for review by the full CAWA network on our web site and in the published REPORT AND PLAN OF ACTION. CAWA Task Force Chairs on the other critical concerns of Human Rights (CEDAW), Violence Against Women, Media, Environment, Girl Child, Peace & Militarism and Institutional Mechanisms are also on line and in the publication. These issues intersect and cross-cut issues such as racism, disabled women, immigrants, gay and Lesbian rights, religion, indigenous women and globalization. We invite you to read and comment at the bottom of each document and to give us your feedback on the survey “Your Voice Counts”. Over 600 organizations partner with CAWA, our 19 regional and county conveners and the task force chairs for a larger voice in public policy in California. For our introductions to the published Report and Call To Action: Still Moving Forward… Locally and Globally and Welcome to The Second Decade. We accept Congresswoman Pelosi’s challenge and intend to keep on moving forward locally, state wide, nationally and globally. We made our voices heard globally by taking our agenda to the United Nations Ten Year Review of the Beijing Plan of Action, New York City, February 27 – March 11, 2005 and will take it to the 50th Session of the UN Commission on the Status of Women in March, 2006. In 2000 we had the advantage of a US Secretary of State who arranged for the 10 Federal Regions to present plans to her for a National US Women’s Agenda, as most of the other 189 countries do who signed off on the original Plan of Action. In 2005, the Bush Administration refused to join 84 heads of state and governments in signing a statement that endorsed the 10-year-old U.N. plan and presented an amendment at the 49th Session in 2005, which was voted down by 187 other countries at the 2005 CSW Session. We recommend the summary document “Beijing Betrayed”, published by the Women’s Environment and Development Organization as the Global document for action.